It’s had an account since 2011, but never set a profile picture until September 2, 2016. A few days later, the company sent out its first few tweet – accidentally leaking the iPhone 7 in the process, about an hour before the event livestream. It then deleted those posts, and – despite having over two million followers – hasn’t posted another tweet in the two years since. That’s why it’s a bit surprising that Apple has decided to livestream its iPhone XS launch on the platform this year, as first reported by TechCrunch. 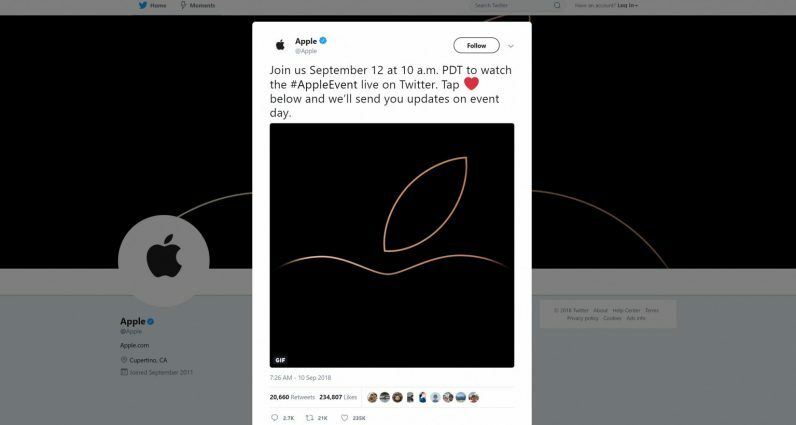 TechCrunch has since confirmed the stream will be live on Twitter itself, rather than Apple linking you to its own stream page. It’s nice to see Apple opening up. After years of event streams being exclusive to Safari, the company added support for Edge in 2016, and then newer versions of Firefox and Chrome for this year’s WWDC. The company also launched its Instagram account about a year ago, showing it was willing to be a little more social. Perhaps the Twitter livestream is another sign the company is increasingly willing to reach beyond its walled garden. Who knows, maybe next year Apple will start to actually use its Facebook account too.